Dr. Mary K. Boudreaux, Professor in the Department of Pathobiology, earned the D.V.M. degree in 1979 at Louisiana State University. She practiced veterinary medicine in California before beginning a clinical pathology residency program under Dr. Julia Blue at Cornell in 1981. She developed an interest in hemostasis and platelet pathophysiology and in 1986 earned a Ph.D. degree in a program jointly sponsored by Cornell University and the Wadsworth Center for Laboratories and Research in Albany. Her co-directors for the research which evaluated regulatory control of cAMP phosphodiesterase in canine platelets were Dr. David O. Slauson, Dr. James Catalfamo, and Dr. W. J. Dodds. 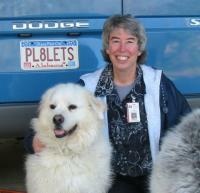 She joined the faculty at Auburn in 1986 and has developed research interests involving platelets. Dr. Boudreaux retired from Auburn University on Jan. 1, 2016, and was granted emeritus status. Evaluating the role of platelets in disease pathogenesis and identification and characterization of congenital platelet disorders. My research interests include evaluating the role of platelets in disease pathogenesis and identification and characterization of congenital platelet disorders. Our platelet laboratory can isolate mammalian platelets from a variety of species for evaluation of platelet reactivity. We have developed a monoclonal antibody (CAP1) that detects a receptor-induced binding site (RIBS) on canine fibrinogen. The antibody has been useful in detection of platelet activation in dogs using flow cytometry and has also been useful in the characterization of congenital platelet disorders. We have developed a method using flow cytometry and CAP1 to identify and characterize platelet disorders in dogs that cannot be taken to Auburn University or other platelet testing facility. These studies require 5 mls of CPDA-1 blood obtained from the affected dog and a normal control sent to my laboratory within 24 hours of blood collection. Platelet aggregation studies evaluating platelet responses to several agonists are also offered; this methodology utilizes platelet rich plasma isolated from whole blood. Patients being tested must be on site for blood collection. For more information on flow cytometry or platelet aggregation studies, please contact Dr. Mary K Boudreaux (boudrmk@auburn.edu). As part of our interest in congenital platelet disorders we determined the normal gene sequences encoding platelet glycoproteins IIb and IIIa in dogs and horses. This work led to the discovery of the genetic basis for Glanzmann thrombasthenia (GT) in Great Pyrenees dogs and Otterhounds as well as the identification of 2 separate mutations causing GT in horses. During the late summer and fall of 2006 distinct mutations in the gene encoding calcium diacylglycerol guanine nucleotide exchange factor I (CalDAG-GEFI) were identified as causing thrombopathia in Basset hounds, Eskimo Spitz, Landseers of European Continental Type (ECT), and Simmental cattle. During the summer of 2007 a mutation in the gene encoding beta1-tubulin was found to correlate with the congenital macrothrombocytopenia described in Cavalier King Charles Spaniels. Since that time the identical mutation has been identified in several other breeds including Chihuahua, Labrador retriever, Poodle, English Toy Spaniel, Shih Tzu, Labradoodle, Maltese, Jack Russell, Havanese, Boxer, Cocker Spaniel, and Bichon Frise. More breeds are likely to be identified. The prevalence of the mutation in CKCS is approximately 90%. More recently a distinct mutation in the gene encoding beta1-tubulin has been identified in Norfolk and Cairn Terriers as a cause for congenital macrothrombocytopenia. In 2009 a mutation in the gene encoding Kindlin-3, a signal transduction protein important in integrin activation in platelets and leukocytes, was identified in a German Shepherd dog. The affected dog experienced life-long bleeding, high white cell counts, and susceptibility to infections. This syndrome is referred to as LAD-I Variant or LAD-III. A German Shepherd-Rottweiler cross in Australia has also been identified with this mutation. Also in 2009 a mutation was identified in the gene encoding the platelet P2Y12 ADP receptor in a Greater Swiss Mountain Dog. This dog experienced prolonged bleeding following a routine spay. The mutation is highly prevalent in the breed with approximately 60% of tested dogs being either AFFECTED or CARRIERS for the mutation.